Ryan Westmoreland announced his retirement as an active player on Wednesday. The former outfielder had not played since 2009 following surgery for a cavernous brain malformation. Westmoreland peaked at number two on the SoxProspects.com rankings, and was ranked the top prospect in the system by Baseball America entering the 2010 season. He had spent the past three years rehabbing and attempting to re-start his professional career, but a setback in July 2012 necessitating another brain surgery has led Westmoreland to choose to end his playing career. Westmoreland, 22, was chosen in the fifth round of the 2008 draft after starring both in the outfield and as a pitcher at Portsmouth (R.I.) High School. The Red Sox were able to steer him away from a full scholarship to Vanderbilt with a $2-million bonus at the 2008 signing deadline, a record at that time for any player taken later than the third round. Assigned to Lowell in 2009, Westmoreland immediately impressed. In 60 games, he hit .296/.401/.484 with seven home runs, 35 RBI, 38 runs scored, and 19 stolen bases, gaining recognition as a New York-Penn League All-Star. A shoulder injury limited Westmoreland to eight games in the field, but it it was enough to gain him recognition as a five-tool phenom. Offseason shoulder surgery did not dampen the enthusiasm. 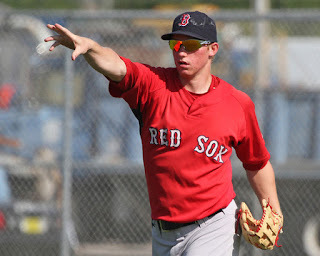 Westmoreland was ranked as the top prospect in the Red Sox system by Baseball America heading into 2010, and drew comparisons with a young Grady Sizemore. On March 4, 2010, Westmoreland was given medical leave from Spring Training, and was diagnosed with a cavernous malformation on his brain stem the following day. Following the surgery and an intense period of rehab, Westmoreland focused his attention on getting back on the baseball field. He fulfilled that goal, seeing game action in the Dominican Instructional League in December 2011. In July 2012, Westmoreland underwent a second surgery for another cavernous malformation. It was this setback that Westmoreland cited in his announcement, emailed to members of the media: "It has become clear that the neurological damage caused by the most recent cavernous malformation and surgery leaves me with physical challenges that make it impossible to play the game at such a high level." Despite the too-early end to his playing career, Westmoreland remains positive. "I believe that there is a plan for me that will utilize my experiences, however painful some may have been, to do something special in my life," he wrote. "It is time for me to find that path, and to pursue it with the same focus and effort that I pursued the dream of playing professional baseball."